The Cody Firearms Museum boasts the most comprehensive collection of American firearms in the world, and their new Collector’s Series gives the public the opportunity to own collectible firearms inspired by prized pieces in their collection. The first offering of the series is a unique rifle built on the award-winning Golden Boy platform manufactured by Henry Repeating Arms, engraved by Baron Engraving of Trumbull, CT, and distributed by Davidson’s of Prescott, AZ. The engraving is based on a Samuel Hoggson factory engraved 1860’s era Henry rifle that is currently held in the Cody Firearms Museum. Both sides of the receiver cover are embellished with a large grape leaf motif on the front panel and a leafy scroll pattern on the main panel. The top tang of the receiver is engraved with the words, “Cody Firearms Museum Collectors Series.” The Golden Boy platform utilizes American Walnut furniture and a blued steel octagonal barrel in homage to the original Henry rifle that came before it. The 1,000 rifles in the initial offering will be serialized 2019CFM0001 – 2019CFM1000. Henry Repeating Arms, Baron Engraving and Davidson’s, the exclusive distributor of this series, have joined together to help raise money for the exhibit with each company contributing a portion of the proceeds from this project to support the revitalization of the Cody Firearms Museum. 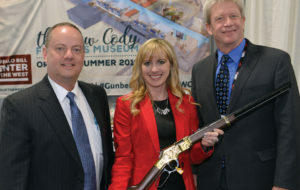 The combined efforts of the three donors will raise more than $100,000 for the Cody Firearms Museum in 2019. In addition, Henry donated a New Original Henry rifle that will be hand engraved by Baron which is expected to raise up to $50,000 more at auction. Davidson’s has also committed to an annual $50,000 donation for the next 5 years. The rifles will be available to retailers exclusively through Davidson’s and will also be available to the public at Davidson’s Gallery of Guns.